Our tackle for this week is getting everything ready for the girls to go back to school. As I mentioned before, we needed very little in the clothing area except a shirt (ordered online Saturday from the uniform store), socks and a pair of shoes. Yesterday became shoe-shopping day for my youngest and thankfully went very smoothly (not always the case:). We had tried a couple of stores last week, but weren’t able to find what we wanted. 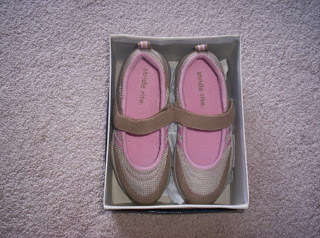 Our first stop on Monday was the Stride-Rite outlet where we found this pair that both she and I liked. Most importantly, they were deemed “comfortable.” You must understand that “comfortable” is the key word for our girls when it comes to shoes! I have learned the hard way that if a pair of shoes is not “comfortable” they are likely to remain in the closet and be worn only upon the insistence of the mother, accompanied by as much moaning and groaning as the child feels she can get away with! Our last tackle is to get mentally ready for the changes to our schedule, which may be the most difficult job of all!! See what others have tackled this week at Tackle It Tuesday. We have to tackle that too!! School shopping can be so much fun! Great tackle!